December 1st in Wordpress Plugins by Wordpress Jedi . Stream: this plugin tracks logged-in user activity, so you can keep an eye on changes made on your site. You will know when changes were made and who was responsible. WassUp Real Time Analytics: lets you analyze your traffic to get a better idea what your visitors are doing on your website. It helps you better understand single user sessions. Simple Login Log: keeps track of user logins and also lets you record failed login attempts, so you can address them. You can export data into a CSV file. ARYO Activity Log: lets you know about the activities that are taking place on your dashboard. 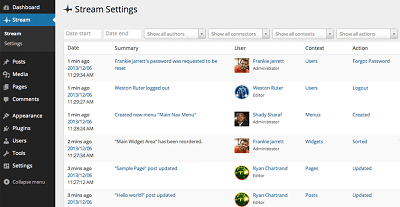 It logs updates, post events, tags, categories, user activity, media, and more. 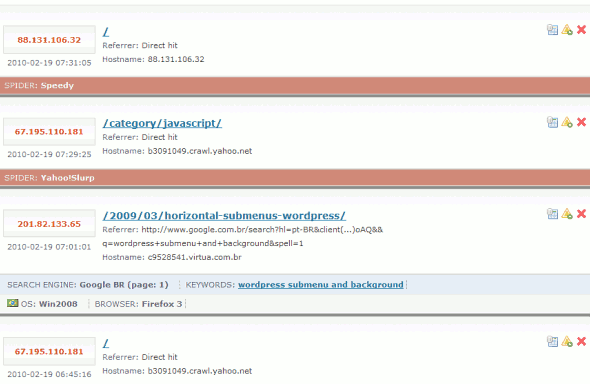 There are of course many other free and premium tools that allow you to track changes and user activity on your site. You just don’t want to go overboard and turn off your audience in the process.